The Department of Buildings BIS-Web Reference Guide, called “Checking the Status of a Certificate of Occupancy,” gives step-by-step instructions for navigating BIS-on-the-Web. 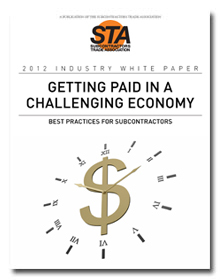 Available to download, the STA offers the below white papers to inform you of better business practices. As an STA member, you have the power of your industry at your side, every day, on every job. Business Practice Interchange. Many of our members call upon our Business Practice Interchange (BPI) to acquire confidential information about general contractors, construction managers, public agencies and builder-owners generally unavailable from any other source. The Business Practice Interchange among STA members is based on a simple principle – the subcontractors who have worked for the clients you are considering know more about their jobs then you do. They know how they run a job, how they treat a subcontractor and how they pay their bills. You can obtain this invaluable information with a simple telephone call to STA. STA Umbrella Actions. STA members also benefit from the coordinated efforts of “Umbrella Actions” which help unpaid subcontractors and suppliers get paid on troubled private projects. On the public side, those subcontractors working for public agencies have the advantage of Government Agency Interaction which helps them in situations of delay and non-action in the processing of Notice of Direction and Change Orders. Our members know that STA is working full-time in Washington, Albany and in New York City to create the legislative and policy change every subcontractor needs to improve and advance their business. Since 1975, STA has been responsible for passing 35 bills that improve the way in which subcontractors do business in New York. As an STA member, you are an essential part of a special group of professionals who affect change within the industry. STA Committees provide an important forum for subcontractors to voice their concerns about general business practices in the construction industry. Our subcontractors know how to get paid and get paid on time. With STA leadership and actively involved colleagues, our members are assured that STA is working on every front to improve payment procedures, policies and laws that will ensure prompt payment. STA is taking a leadership position in working with its members and with construction contractors, owners and owner representatives to educate all parties about the need for prompt payment and damage for delay recourse. 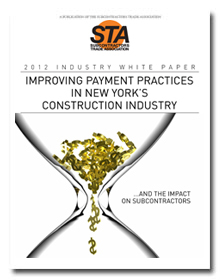 STA is committed to achieving industry-wide change to achieve prompt payment. You need to know as much about the contractor who hires you as you can. STA’s Monthly StayAlert Lien Reports provides you with the latest available information about liens filed. This is an invaluable business tool that helps you steer clear of contractors and owner-builders who do not pay their bills. Highly successful subcontractors have the right relationships. They are connected within the industry and participate in both professional educational programs led by prominent industry experts. They also know the value of relationships on a social level and actively participate in our recognized events such as our Annual Awards Dinner that attracts over 400 attendees and STA’s Annual Golf Outing, another not-to-be missed event. STA’s General Membership Meetings provide forums to learn how to do better business and meet leading contractors, construction managers and suppliers who are key to doing better business. Buying better is another key to operating a highly successful business. STA members benefit from several purchasing programs that produce added value and return significant savings. Take advantage of significant discounts through STA’s purchasing program through the National Subcontractors Alliance. Benefit from reduced workers’ compensation costs from the largest Safety Group in New York State. It’s a benefit of membership only available to STA members. STA members receive preferred, discounted rates for vital services and supplies. Knowing how to buy right is a critical key to business success and STA supports this important practice. Even New York’s Mayor receives a copy of STA’s informative newsletter. Packed with legal, financial and practical easy-to-read advice, STA members receive a monthly newsletter 10 times during the year. When an issue is critically important to our members, we communicate the latest information that helps them make better business decisions. White Papers cover a variety of topics and are published periodically. Best Practice workshops are another component of STA activities. Some sessions attract hundreds of participants; others use small group forums to facilitate educational outcomes. With several hundred of the best known and most respected subcontractors, we welcome subcontractors who understand the value of our association. STA invites you to join the ranks of New York’s best subcontractors and become one of our professional colleagues. STA is an association that makes bottom line business sense. To learn more, contact us at info@stany.org or call us at 212.398.6220. Follow the STA on social media to stay up to date with the association happenings and industry news!